today Alexander Geppart and me would like to contribute to the wishes of Fábio Luiz Esperati Pagoti from his blog post and @michelle.crapo5: My Wishes for SAP in 2018. We come up with some combined feature request to improve working with #ADT in real live conditions. We have used #ADT it in our current project in a team of +10 developers for more than three years now . Import / export the dynamic #ADT logpoints to place them in #charm tickets for re-occurring issues and transport into other systems. alphabetic sorting of of methods during transport should not be done. For DDL sources add the possibility to open the data preview in other project. We are developing in client 100 but all the data is in client 300 so I need to have the data preview in client 300. Release information for new #ADT Plugins in terms of what is new etc. New features are usually mentioned in the release notes within ecilpse. For third party plugins I guess you just have to watch the marketplace. I am aware of the ATC / SCI methods, but that is a bit unhandy, but possible, yes. Second, great! that’s it! I will update the blog. My comment – is just a simple one. thanks for the blog. We really appreciate the wishes from our ADT community. Do you know the option to delete unused variable in eclipse? Why not just add an option ‘Show unused variables’. 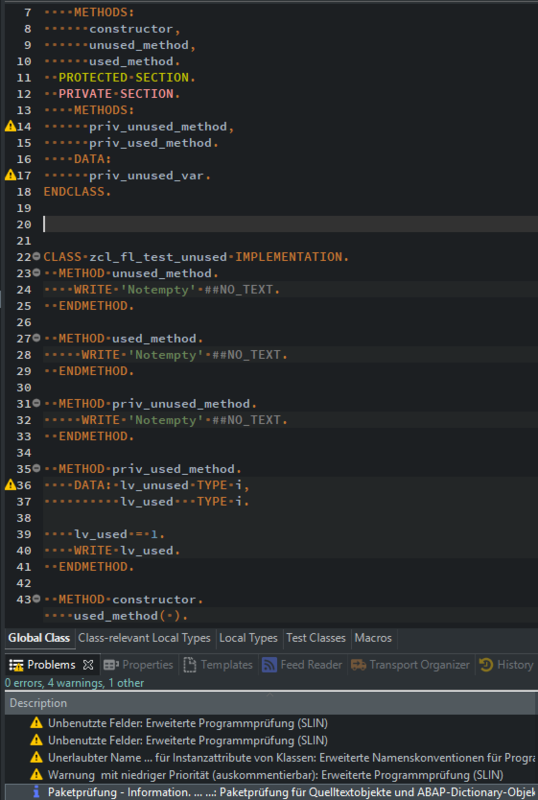 Maybe with the option to have this executed automatically when the editor opens like the automatic syntax check. What do you think? Yes exactly, not overflow people who do not want so much information…. I’m not sure that automatic deletion of all unused variables without first reviewing them is a good idea. From my experience, unused variables point many times to code which should be adjusted. I have one additional point to add: Support of CTS-Projects in transport request dialog. Our main development system is configured to enforce a cts-project in every transport request but eclipse simply ignores this setting. Up until now I understand that with charm the development objects are locked cross system what exactly what out customers do NOT want. For our own development systems we use CTS to cluster developments into shippable units and get some dependencies automatically delivered by the SAP standard. For this use case charm would be a total overkill. in some systems we have (at least) two clients, one for development and one with data. If I want to debug changes in the code I have to open the source in the data client and set the breakpoint. No problem. But if I’ve changed the code again and want to set the breakpoint somewhere else, I first have to close the tab and reopen it again. Same with “remote pair programming” (or better education). In the last couple of days I tried to show a collegue of mine some ABAP tips and tricks on her report. “Try this, use that, …”. Because we are not working in the same building I often had to reload the report to see the changes. We are also planning on adding a dedicated refresh button to the main toolbar (similar like in web browsers). This should making it easier to find. By the way. Did a refresh now after my collegue changed the code and now the “Undo Typing” option is active in my editor and all the changes could be reverted by me. Intentionally?